Robot technology has improved and bifurcated in more and more varied and advanced streams and now robot is not confined within the conventional idea of performing some petty coded works. But Robots are way more advanced with an extent of pervasion in them. Nextage is one such humanoid robot that is designed to be more a companion than a machine. The robot will be able to make some flavored brewing coffee and you do not need to worry anymore. the concept of incorporating such companionship and friendly behavior is that the makers feel that people waste a lot of time doing trivial daily household chores like cooking, making coffee or cleaning and dusting. So it would be a great idea to keep a humanoid robot to take care of these works so that people csn focus kore on their work and creativity. 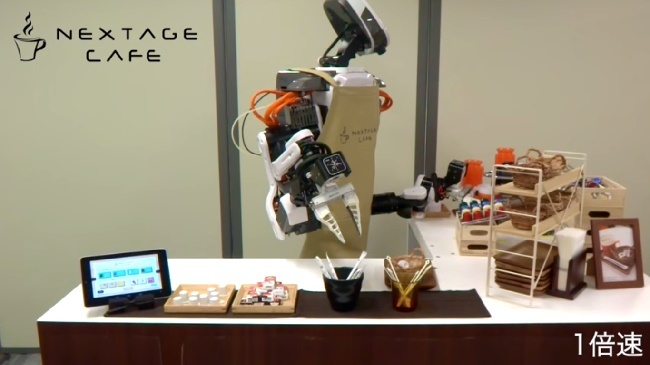 The video not only shows that Nextage is making some real tasty coffee but also arranging the coffee in a tray with snacks and supplementary things. So that’s really exciting! Check out the video. It’s so much interesting.